Ever since I made a giant batch of Cajun Seasoning Blend for my "Creamy Cajun Chicken Pasta", I've been on a major kick with that flavor profile. 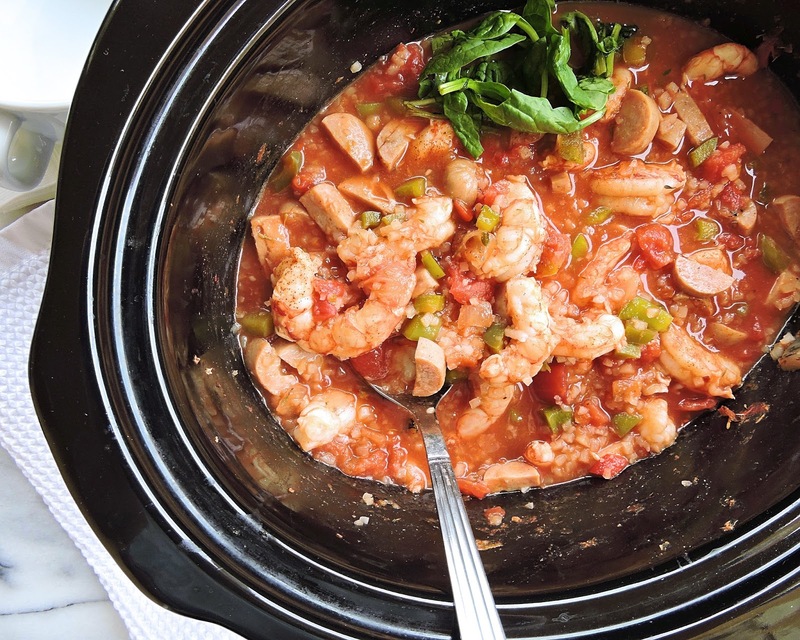 I just love the savory-spicy kick that even a pinch of Cajun spice adds to any dish. Cajun scrambled eggs? Yum. Cajun chicken soup? Delicious. Cajun Slow Cooker Jambalaya? Perfect. After some playing around in the kitchen, I've got another perfectly spiced, EASY recipe for you guys to put your Cajun seasoning blend to good use: and this time it's done slow. That means you go out and live your life, and get stuff done. Come home, and dinner is waiting. 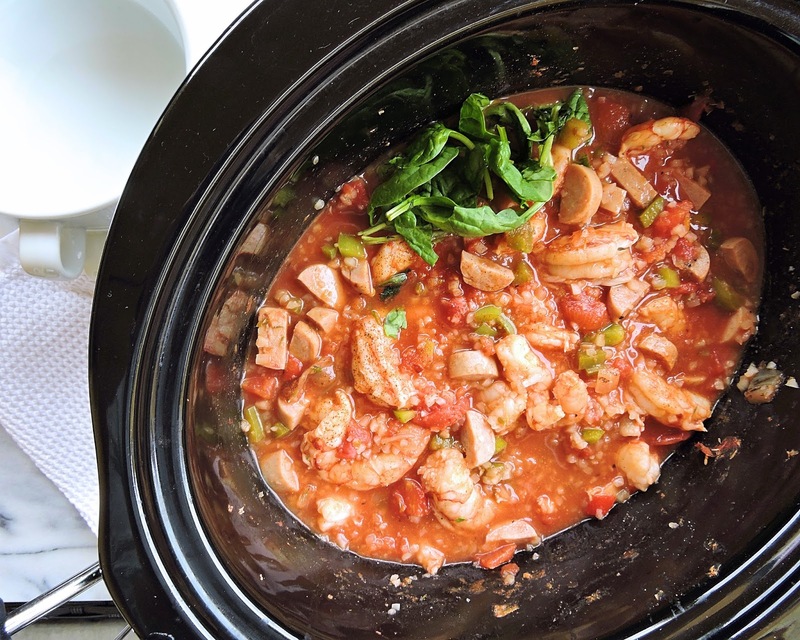 I just love me a slow cooker meal... don't you!? 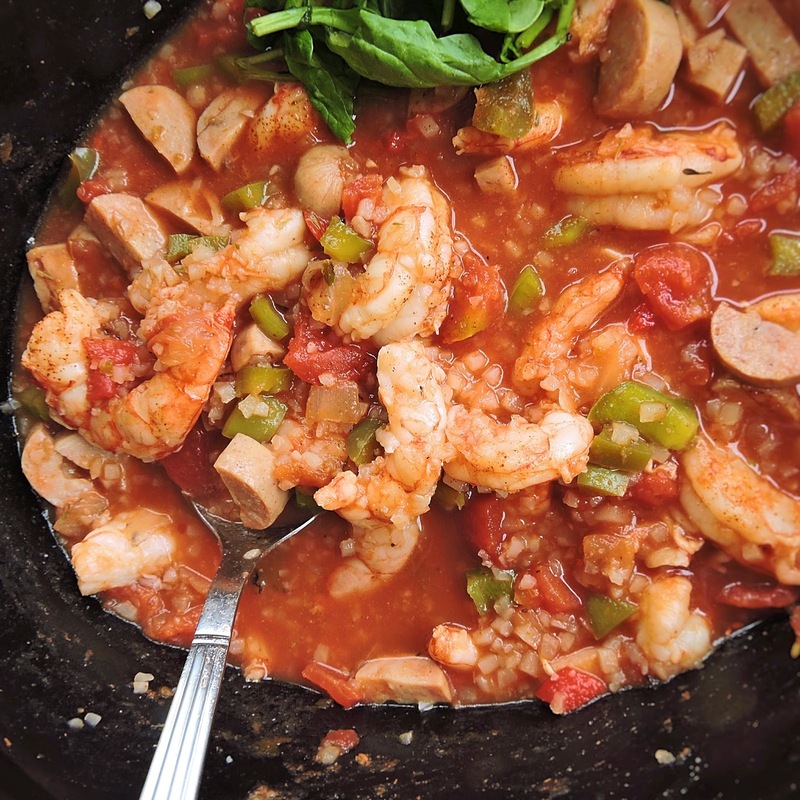 So if you're a spicy fiend like I am - totally go for the andouille sausage in this. Trader Joe's makes a great one, and I've seen a Cajun one from Aidell's too (just keep an eye out for added sugar in both if you're on a Whole30). If you're more of a sweet-savory kind of person, try this dish with chicken apple sausage! My all-time-fav Whole30 compliant (meaning no added sweeteners or "stuff") is hands-down the Aidell's chicken apple sausage. It's more savory than sweet, and adds the perfect flavor to this dish. Hope you give this one a try, and enjoy! Let us know down below if you make any changes we should hear about. In a slow cooker, mix the sausage*, tomatoes, bell pepper, onion, bone broth, tomato paste, and seasoning. Cover and cook for 7 to 8 hours on low, or 3 to 4 hours on high. 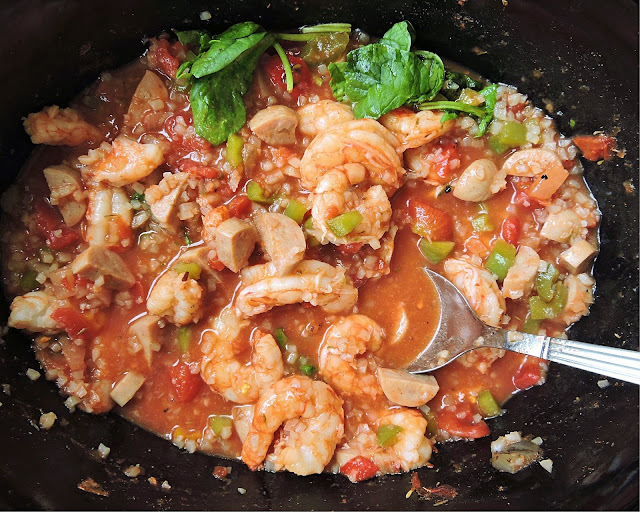 During the last 30 minutes of cook time, stir in the shrimp and cauliflower rice (cook for an additional 30 minutes if the shrimp and/or rice are frozen). Scoop into bowls & serve hot! If you want extra color and flavor on the sausage, you can quickly brown it in a pan first. Slice it up, then brown each side for 2-3 minutes in a bit of cooking fat. 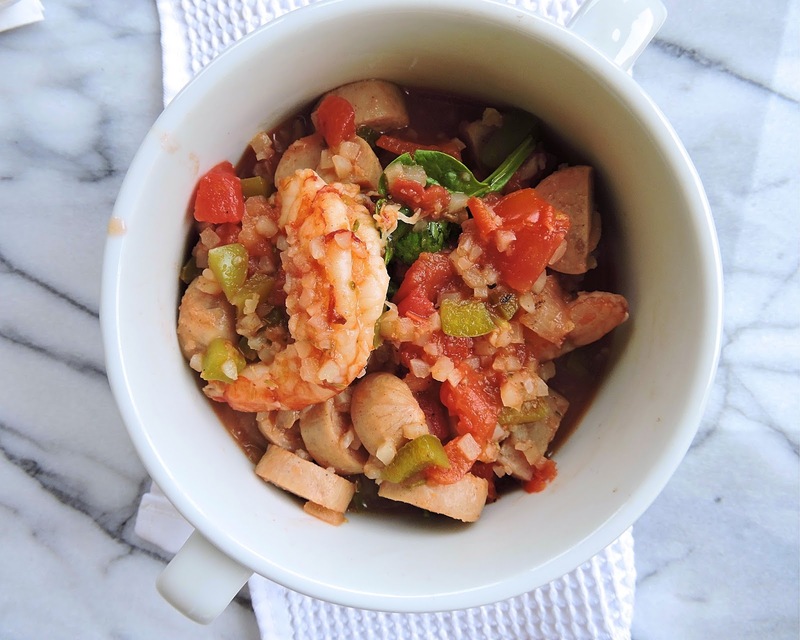 If you tolerate grains, this would be perfect over white rice to soak up all of those yummy juices! Jessie has the best sense of intense flavors w/ the perfect balance. This was ridiculous good! 2nd recipe I have used from Jessie & both are amazing good! NOTHING is lacking in this dish! Prob the best Jambalaya I have ever tasted where flavor is concerned! That's one of the sweetest comments I've ever received, THANK YOU! I'm beyond flattered!!! I made this last night on the stovetop ...... it was amazing!!!! Can't wait to try the chili next week! Hi Jessie, I need some ideas. I made this today and it turned out dry. I followed the recipe to a T.
Jessie, it looks like your pictures have way more than liquid than mine. (I just threw it in the crockpot). Is it just 1/2 cup of broth? Or should the tomatoes not be drained? Maybe I should add more broth? Thanks so much for your thoughts! I added an additional cup of broth. Hi! So if I’m making this on the stove top, how long do you think the cooking time is? Jesse B. This recipe sound great and I'm planning to try it. One question: I have a pre-mixed Cajun spice from Louisiana Fish Fry Products. Any idea how much of that I should use? Totaling up the spice quantities in the recipe gives a HUGE total quantity of spices.